Roll dough flat into a rectangular shape ¼-inch thick. Cover with cinnamon sugar. Roll into log shape and use sharp knife to slice into 5 equal-size rolls. Mix together melted butter, brown sugar, and heavy cream in 12 x 24-inch baking pan. Split equally if using two 9 x 13-inch pans. Place cut rolls into caramel-filled pan. For best results, let rise overnight in refrigerator, or rise for 2-3 hours at room temperature. Bake in convection oven at 300°F for 45 minutes or in conventional oven at 350°F for 60 minutes. Tops will be golden brown when done. 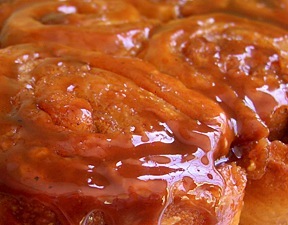 Let sit for 15 to 20 minutes to let caramel set up—this is key so the caramel sticks to the rolls.